Prescribing a solution without first diagnosing the problem is malpractice, whether in medicine or management consulting. Just as a doctor begins by measuring the vital signs —blood pressure, heart beat, and temperature– I began by determining consensus around vision, mission, and values. Too many organizations treat these guiding principles are little more than ”wall art”, colorful posters which decorate hallways and conference rooms. But leaders in high-performing companies have discovered how to make them powerful management tools which align head and heart. Here is a simple process you can use to test whether your team shares consensus around the vision and mission. This “secret sauce” process works well with 6 to 30 persons from a senior management team, an intact work unit, a project team, or other groupings. Start by handing out two blank 3 x 5 cards and have each person write down their organization’s vision and mission on one card, and values on another from memory (without glancing around for clues). Then collect the cards, give them a good shuffle and distribute them randomly. In less than two hours, this tech group developed vision and mission statements that resonated with all. After a well-earned break, we then turned to values. DO YOUR VALUES ADD VALUE? 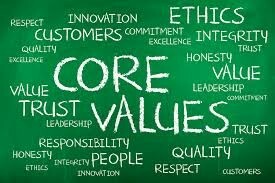 When it comes to your corporate values, do people consistently walk the talk, or do they usually stumble the mumble? The tech group members next swapped the 3×5 cards people wrote their values on and again shared. People recalled most of them but acknowledged that in practice, these values were mostly given lip service. 1.Can people recite their essence? 2. Do people really believe in them? 3. Do people reference them in daily work? 4. Do customers embrace similar values? 5. Do they translate into measurable behaviors? The group recalled most of them, but acknowledged that values were mostly given lip service. At the risk of committing heresy , try this surprisingly simple process which my clients love because it brings values alive. I call it localizing your values. Localizing your values means custom-creating a value set which optimizes group performance. Corporate values tend to be too broad and general. The values which make an effective Engineering Department differ from the optimum value set of Legal, R&D, HR, and other departments. One size does not fit all. What values would be present if we were living our mission, doing great work, advancing our careers, serving our customers, making money, and having fun? Plenty of ideas spilled out which I captured on a whiteboard. After some rewording, massaging and combining, we ended up with an emotionally engaging set that all rallied around. The energy in the room was running high because the group now had a sense of shared purpose. People were excited and united. With this foundation in place, we then moved on to develop a smarter strategy, define metrics, and launch key initiatives. While it’s still too early to report measurable results, the process galvanized the team and the retreat concluded with renewed energy, commitment, caring, and confidence. Blizzard Entertainment is an industry leader in massive multi-player online role-playing games. This 4,000 person company offers a stellar example of how the best firms put values to practical and profitable use. Several years ago, Blizzard co-founder Frank Pearce invited me to facilitate a leadership session to develop their mission and values, a task they had failed to accomplish in several previous attempts. In what was an engaging and high-energy approach befitting their fast-paced culture, we identified 8 core values. They included gameplay first; commit to quality; play nice, play fair, and my favorite — embrace your inner geek. Everyone there was impressed by what we accomplished during the fast-paced workshop, but what impressed me is what happened after. Blizzard employees take these values seriously. They consciously refer to them in daily work and when making key decisions. When Blizzard interviews a potential hire, they ask which value most resonates with them and why. Because everyone from the CEO to game designers to customer service reps embrace and live these values, their retention rates lead the industry and the company continues to produce award-winning games and events. Be honest with yourself. Do the values your group practices make you eager to go to work each day? Do they promote a high-performance, collaborative culture where people perform at their best and the company thrives? Or have they gone stale? When would now be a good time to give them an upgrade? Terry Schmidt is a business strategist and author of Strategic Project Management Made Simple, and chief honcho at ManagementPro.com. ← Are you a Frustrated and Overworked Project Manager?